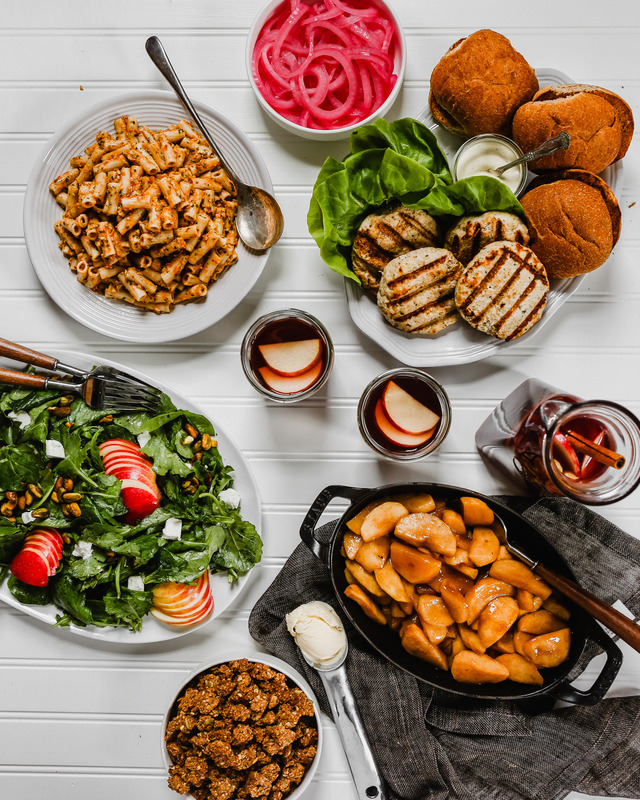 It’s time we round out our Goodbye Garden Party menu with a bang. 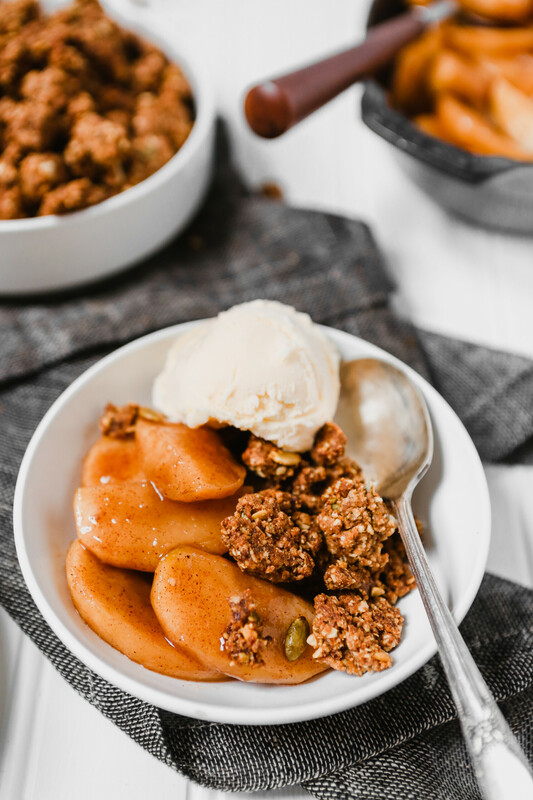 And this healthy deconstructed apple crisp is the perfect wholesome dessert to get the job done. It tastes good, makes us feel good, is easy to make and can even be made ahead. 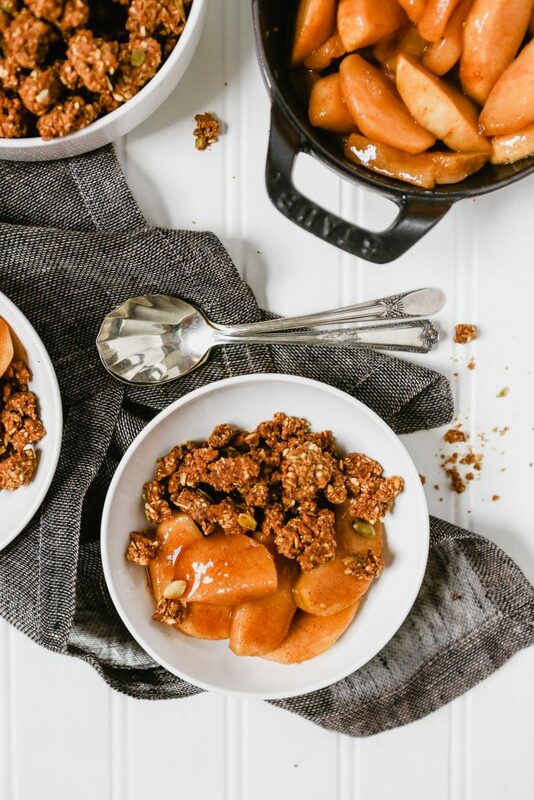 This healthy apple crisp is made with coconut sugar and maple syrup (no refined sugars! ), whole-wheat flour, oats, apples and warm fall spices. It’s simple, wholesome and delicious. 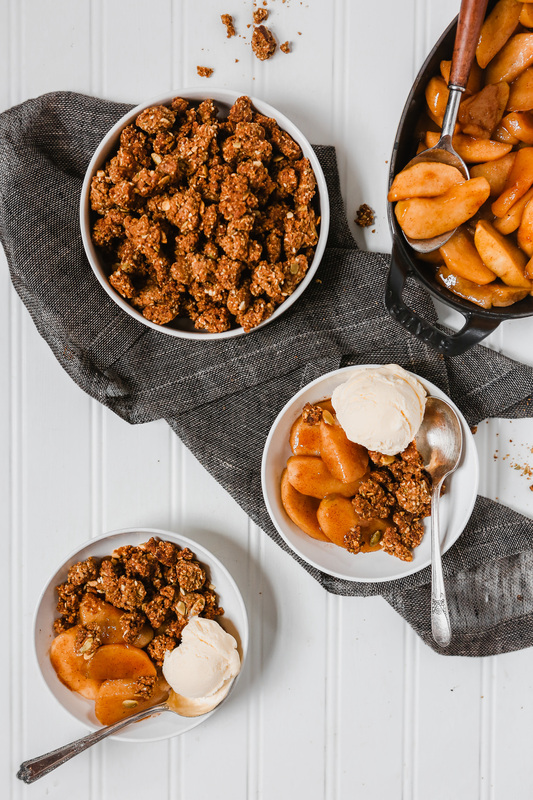 What type of apples are best for apple crisp? For any kind of apple dessert (crisp, pie, crumble, cobbler, etc.) I recommend using two different types of apples. Why? Well it really all comes down to balance. Like with any dish, sweet or savory, it’s important to strike a balance in both flavor and texture. For apple desserts I look for a firm apple as well as a softer, more crisp apple. And when it comes to flavor I like to balance between a tart and a sweet apple. 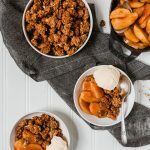 For this healthy apple crisp recipe I recommend using Granny Smith (firm and tart) in combination with Honeycrisp (crisp and sweet), although Pink Lady, Gala and Braeburn work well too. 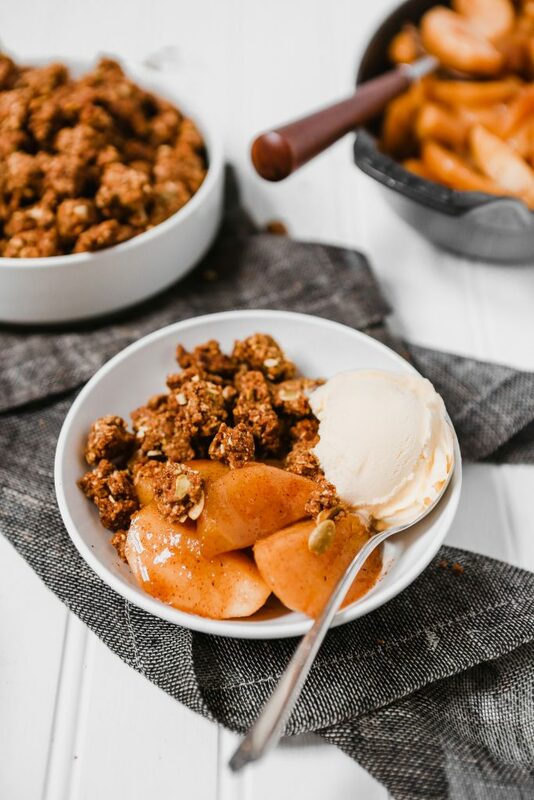 How is this apple crisp healthier/more wholesome? Where to begin!? 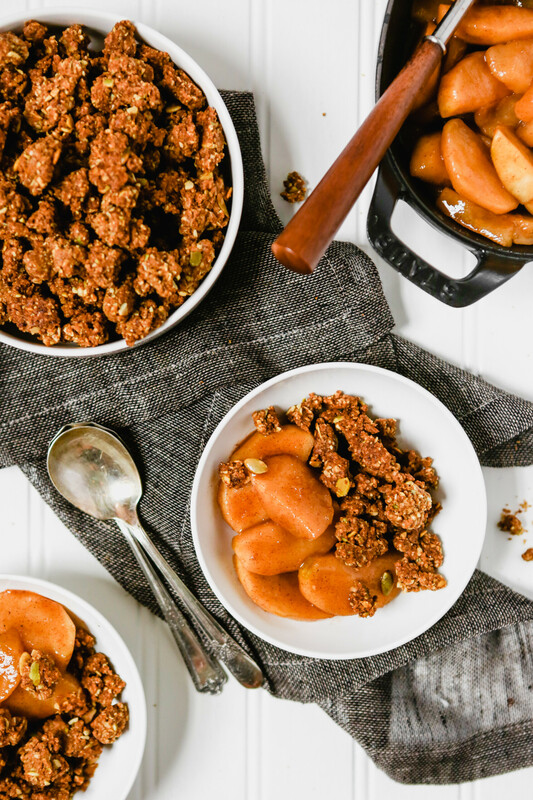 For this healthy deconstructed apple crisp I first set my sights on using only whole-grains. I swapped out the all-purpose flour for white whole-wheat flour (which is nearly unnoticeable) and added old-fashioned rolled oats—a classic crisp ingredient. For sugar I swapped refined white sugar for coconut sugar and pure maple syrup. 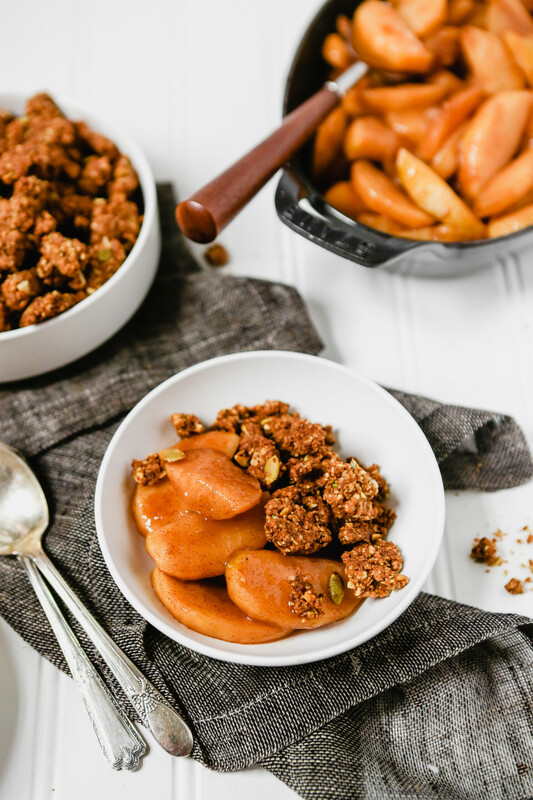 Not only is this dessert naturally sweetened, but it’s also more flavorful because of it! 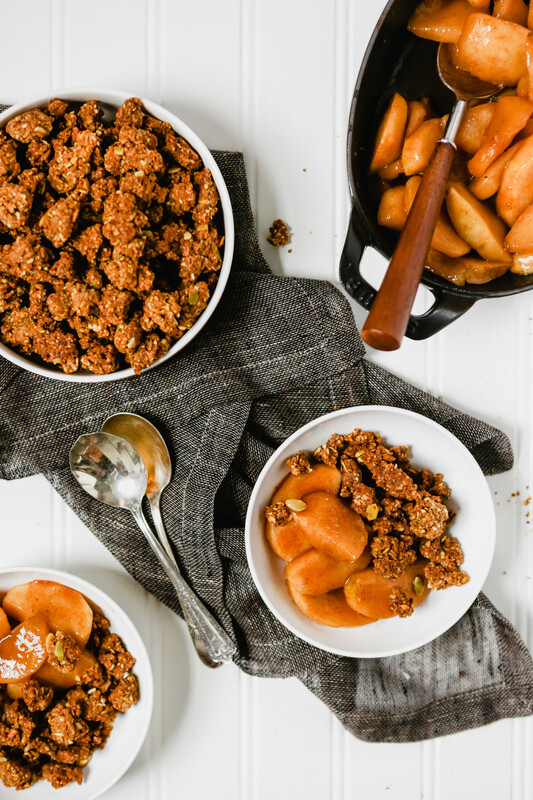 Other than a little bit of butter, which is good for the soul, this dessert is simply made of fruit, whole-grains and natural sugars. Why would I want to serve apple crisp deconstructed? When it comes to serving dessert for a small party or get-together, I like to let guests serve themselves. Especially for a fruit desert like this where some people may prefer more apples than crisp while others might only want the crisp topping and a scoop of ice cream. And although balance (as I mentioned earlier) is essential to the success or flop of a dish, so is preference. Don’t underestimate the important of preference. Serving a deconstructed dessert encourages guests to get involved with the meal while also giving them the reigns to something that’s often predetermined for them, even if they’re the cook. Plus, who doesn’t like a dessert bar? I mean come ooon. Want the full menu? Here’s ZK’s complete Goodbye Garden Party menu! Heat oven to 350° with racks set in lowest and middle positions. For the apple filling, combine cornstarch and lemon juice in an 8-inch baking dish. Add apples, coconut sugar, maple syrup, cinnamon, nutmeg, cardamom, and salt to baking dish and toss until thoroughly combined. Cover baking dish tightly with foil; set aside. For the oat topping, combine flour, oats, coconut sugar, turbinado sugar, cinnamon, nutmeg, cardamom, and salt in a food processor. Pulse until oats are partially chopped and ingredients are combined, about 10 pulses. Scatter butter pieces, ¼ cup of pepitas, and vanilla over top of flour mixture. Process until mixture clumps together into large crumbly balls, about 30 seconds, scraping down sides of bowl halfway through processing. Sprinkle remaining ¼ cup pepitas over topping mixture and pulse until just combined, 10–15 pulses. Pack topping mixture together into a ball then break into ½-inch chunks (small crumbly bits are OK) on prepared baking sheet in a single layer. Bake topping on middle rack until chunks are brown and crisp, 25–30 minutes, rotating pan halfway through baking. While topping is baking on middle rack, bake apple filling, covered with foil, on the lower rack for 40 minutes. Remove foil from baking pan, stir apples, increase heat to 375°, and continue baking until juices are bubbly and thick and apples are tender but not mushy, about 40 minutes more. 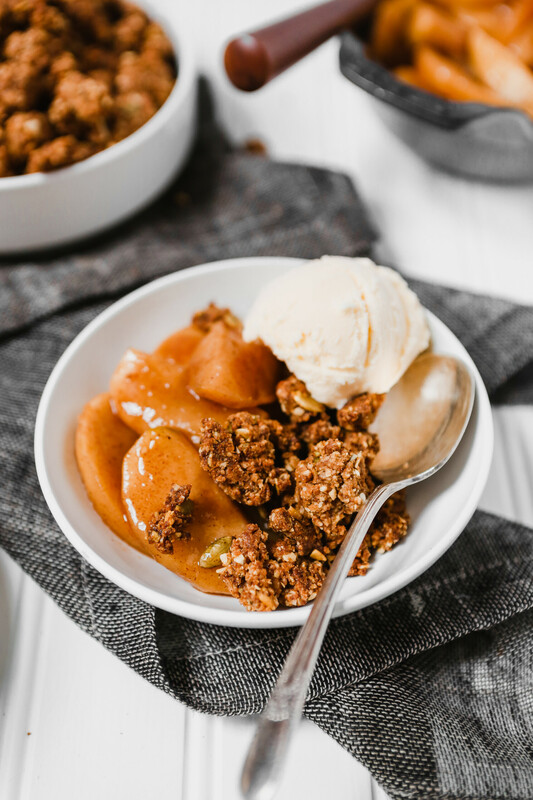 Spoon apple filling into bowls, sprinkle oat topping over filling and top with ice cream. Oat topping can be make up to 5 days ahead. Bake topping as directed until crispy, cool completely on pan, then transfer to a resealable zipper-lock bag or container with tight fitting lid. Store at room temperature until ready to serve. Filling can be made up to 3 days ahead. Bake as directed then transfer to a glass container with a tight fitting lid and refrigerate. When ready to serve, transfer apple filing to a baking dish and reheat in a 350° oven until heated through.